Rebound headache, or what we now refer to as medication-overuse headache (MOH), is an important to recognize secondary headache because it diminishes the efficacy of preventive headache medicines, is associated with migraine chronification, and is treatable. Yet patients and clinicians alike are all too often unaware of MOH, hampering effective treatment. Fabian Rossi and colleagues, in question and answer format, present a comprehensive and practical overview of all things MOH. Medication-overuse headache (MOH) is a pattern of chronic daily headaches, in a patient with a pre-existing headache condition, caused by regular and excessive use of symptomatic and acute headache medications for 3 months or more. It is a secondary disorder in that it is caused by the very medications a patient uses to treat his or her headaches.1 For acetaminophen and non-steroidal anti-inflammatory drugs (NSAIDs), overuse is defined as taking the medications on 15 or more days per month. For triptans, ergotamines, opioids, and combination analgesics, medication overuse is defined as taking the medication on 10 or more days per month.1 MOH may also occur when multiple drugs are used on 10 or more days per month, even though no single one of the medications is used on more than 10 days per month. What Is the Epidemiology of Medication-Overuse Headache? Approximately 50% of patients with chronic headache have MOH and the overall prevalence is 1% to 2%.2,3 The condition is more common in midlife, and less so among children and elderly. It is more than 3 times more common in women than in men and is thought to be one of the costliest headache disorders, with the majority of the cost being indirect from lost productivity and absenteeism from work. Risk factors for MOH include low socioeconomic status, higher body mass index, and anxiety and depression. The condition is more common in midlife, and less so among children and elderly. Which Drugs Cause Medication-Overuse Headache? Although virtually all drugs used for acute or symptomatic treatment of headache can cause MOH,4 and over-the-counter NSAIDs, acetaminophen, and combination analgesics are most frequently used, patients requiring secondary or tertiary care are more likely to be taking centrally acting drugs such as opioids, triptans, butalbital-containing combination pills, and over-the-counter combination products such as Excedrin (acetaminophen/aspirin/caffeine). The most likely medications causing MOH varies geographically and over time. Does Medication-Overuse Headache Occur in Isolation From Other Types of Headache? MOH, by definition, occurs only in individuals who already have a headache disorder.1 It does not occur de novo without history of headache. The majority of patients with MOH also have migraines or tension-type headache. Some will have cluster-type headache, and only a few will have newly diagnosed daily headaches. How Is Medication-Overuse Headache Diagnosed? The diagnosis is made clinically by taking a careful and thorough history of the frequency of headaches and the medications used to treat them. As symptoms of location, severity, and character of the headache may vary considerably, it is the quantity, not the quality of headache in a patient with pre-existing headache that should make one suspect MOH. In any patient experiencing chronic headache, the pattern and frequency of medication use should be assessed to confirm or rule out MOH. MOH is usually worse in the morning after awakening and is often associated with neck pain, autonomic features, and anxiety and depression. Acute symptomatic treatment provides only transient relief, leading to continued and gradually escalating overuse of abortive medications. The clinician must carefully ask what medications the patient took for each headache and then patiently ask again if they took anything else as patients may not remember to state taking more than one medication. Clinicians should also carefully assess whether medications not specific to headache that may contain acetominophen were also used, such as cold remedies. A headache diary that the patient keeps and uses to carefully document what medications he or she takes and when, can be very helpful in making the diagnosis of MOH. Patient education about medication overuse also plays a critical role in prevention and treatment of MOH and can be done during the clinical visit. Other headache disorders, primary or secondary, also need to be considered in the differential diagnosis. Patients should undergo diagnostic testing, if appropriate, to rule out secondary causes of headache. What Is the Pathophysiology of Medication-Overuse Headache? It is unclear whether MOH is a consequence of living with chronic daily headache or the reverse, but it is clear that withdrawal of the overused drug(s) bring(s) relief to the majority of patients, suggesting a causative role for the medications. However, not everyone with medication overuse develops MOH. As the mechanism of action for the overused drugs differs from one another, it is unlikely that MOH is caused by a specific action of any of these drugs. As pre-existing headaches seem to be required for MOH to develop (daily use of these drugs for other conditions does not cause MOH), there seems to be a relationship between the pre-existing headache mechanism or pain pathway and MOH. However, the nature of those mechanisms for activating pain pathways is not yet fully understood. What Is the Treatment for Medication-Overuse Headache? The generally accepted treatment is detoxification through withdrawal of the overused medication(s) and the use of “bridge therapy” to help the patient through the period of withdrawal. This is followed by initiation or reinforcement of prophylactic therapy and is another time for patient education regarding MOH. Triptans and NSAIDs can be stopped immediately without causing withdrawal effects; however, headache symptoms may worsen. Opioids, barbiturates, and caffeine should be tapered off slowly to avoid withdrawal symptoms. Withdrawal symptoms include worsening of headache symptoms, vomiting, nausea, tachycardia, hypotension, sleep disturbances, anxiety, and nervousness. Withdrawal varies with each drug and may take as long as 10 days depending on the drug that is being discontinued. What Is the Prognosis for Mediation-Overuse Headache? Left untreated, MOH contributes to the development of a chronic and refractory character to headaches, which become less responsive to both preventive and acute medications.11 This leads to profound disability and poor quality of life. Patients with MOH are also at risk of other, non-headache-related complications secondary to the frequent use of acute medications, such as gastrointestinal bleeding, renal and liver failure, and addiction and dependence. How Can Medication-Overuse Headache Be Prevented? The high rate of relapse and high cost of MOH makes prevention of great importance. Use of acute medications in patients with episodic and chronic migraine should be carefully limited. 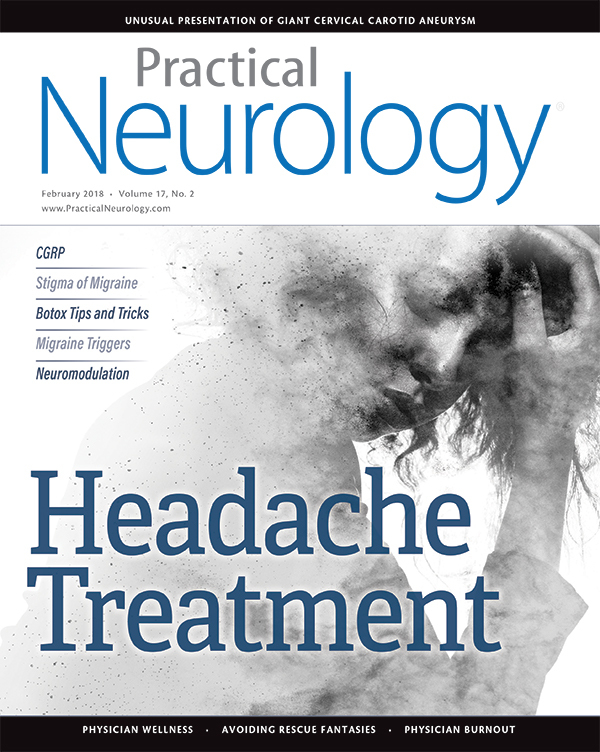 The rationale for restriction should be explained to the patient with serious warnings about the risk of developing MOH.13 The acute management schedule should be optimized by using highly effective and specific migraine medications, with the goal of sustained pain-free response, rather than using less effective, nonspecific medications, which give only partial relief, and therefore require multiple doses. The use of effective medication at an optimal dose as early in the attack as possible and while the pain is still mild to optimize response to treatment should be encouraged. 1. Headache Classification Committee of the International Headache Society (IHS). The International Classification of Headache Disorders, 3rd edition (beta version). Cephalalgia. 2013;33:629-808. 2. Kristoffersen ES, Lundqvist C. Medication-overuse headache: epidemiology, diagnosis and treatment. Therapeutic Advances in Drug Safety. 2014;5(2):87-99. 3. Westergaard ML, Hansen EH, Glümer C, et al. Definitions of medication-overuse headache in population-based studies and their implications on prevalence estimates: a systematic review. Cephalalgia. 2014;34:409-425. 4. Abrams BM. Medication overuse headaches. Med Clin North Am. 2013;97:337-352. 5. Cupini LM, Sarchielli P, Calabresi P Medication overuse headache: neurobiological, behavioural and therapeutic aspects. 6. Katsarava Z, Jensen R. Medication-overuse headache: where are we now? Curr Opin Neurol. 2007;20:326-330. 7. Saper JR, Hamel RL, Lake AE, 3rd. Medication overuse headache (MOH) is a biobehavioural disorder. Cephalalgia. 2005;25:545-546. 8. Boes CJ, Black DF, Dodick DW. Pathophysiology and management of transformed migraine and medication overuse headache. Semin Neurol. 2006;26:232-241. 9. Freitag FG, Lake A 3rd, Lipton R, et al. Inpatient treatment of headache: an evidence-based assessment. US Headache Guidelines Consortium, Section on Inpatient Treatment Chairpersons. Headache. 2004;44:342-360. 10. Boe M., Mygland A., Salvesen R. (2007) prednisolone does not reduce withdrawal headache. Neurology 69: 26–31. 12. Mathew NT, Kurman R, Perez F. Drug induced refractory headache: clinical features and management. Headache. 1990;30:634-638. 13. Katsarava Z, Muessig M, Dzagnidze A, et al. Medication overuse headache: rates and predictors for relapse in a 4-year prospective study. Cephalalgia. 2005;25:12-15. A new treatment for managing migraine in the clinic is on the horizon. Stigma leads to loss of status and diminished quality of life. Understanding trigger perception can improve management. External alteration of nerve activity can be effective in treating headache.